12 Beach Umbrella Brads. 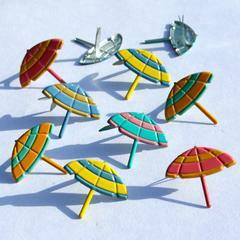 These brads can be used to embellish your Hawaiian scrapbook page or cards. Mix of orange/coral, blue/orange, yellow/blue, orange/green, green/pink. Size: 19mm.